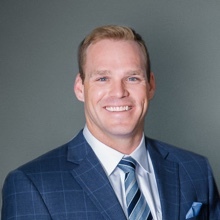 Michael Craig is an Advisor with Catalyst Solutions Group where he joined the firm in 2018. Michael has served in a variety of industries, including managing skydiving centers, corporate fundraising, nonprofit development, and TV advertising production. Each gives him a unique ability to serve business owners and individuals in a wide range of industries and backgrounds. His ultimate focus in every role has always been to build meaningful relationships with his client which culminates in exceptional client care. Michael’s diverse background provides him with a distinct aptitude for finding creative and effective solutions for his client’s needs. Michael grew up in Harbor Springs, MI sailing, skiing, and enjoying all aspects of outdoor life. He graduated from Denison University with a B.S. in Political Science. Today, Michael lives in Grosse Pointe, MI with his wife, Alison and their two Labrador rescues. He serves on the Board of Directors for The Children’s Center and works closely with the Juvenile Diabetes Research Fund, mentoring children and families with Type 1 Diabetes. He spends his free time pursuing his passions for fitness, philanthropy, literature, competitive sailing, and all things “Northern Michigan”.